Adjustable browning controls for greater versatility. Cool-touch ABS front and back panels. 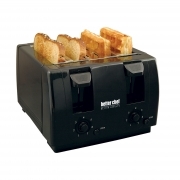 Great for bread, waffles, bagels and more. Cancel button stops toasting anytime. Slide open crumb-tray for easy clean-up.